Hot Wheels Cars Gift Pack is the perfect gift for your little car racer. Boys have the craze about cars and other automotive vehicles so they have the hobby to collect and play with those cars. 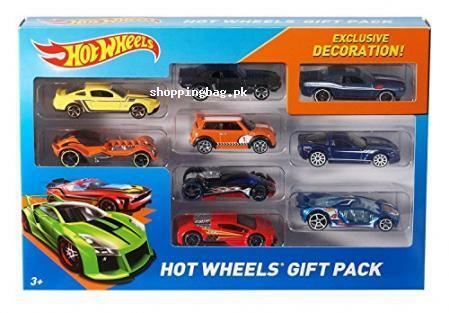 This gift pack has 9 hot wheel cars which are designed in different style. Each of the cars is articulated in unique and classy design and it is available in a scale of 1:64. The enthralling cars pack can engage the kids in car racing for hours. It is highly durable and enduring as it is made from high quality material. Kids can have fun with the speedy cars and boost their enthusiasm of cars. It would be the best surprise present for the boys who love the video game of hot wheels. You can explore the inventory of Amazon imported products in Pakistan and get the reasonable Hot Wheels Cars Gift Pack price in Pakistan. Make your kids happy and cheerful with their favorite cars. On single order placement, you will get the Amazon product in Pakistan, directly at your doorstep, in the best delivery time. Pay cash on delivery for your ordered pack of hot wheel cars and have the contented experience of Amazon online shopping in Pakistan. It s the perfect gift for vehicle lovers of all ages. Speed and action all in a pack of 9 die-cast hot wheels cars. 9 of the coolest 1:64 scale die-cast vehicles. Includes 1 exclusive decoration car, not available anywhere else. Each pack is an instant collection.